Create a country-chic, vintage look in your farmhouse style home with the Sawyer Mill Blue Ticking Stripe Curtains. Timeless and true, these country curtains feature beautifully textured cotton fabric in denim blue and soft white ticking stripes offering a simple, romantic feel you can't resist. Coordinates well with the Sawyer Mill Blue Ticking Stripe bedding. 100% Cotton Create a country-chic, vintage look in your farmhouse style home with the S..
100% Cotton Dress up your window with the vintage farmhouse inspired Sawyer Mill Blue T..
100% Cotton The Sawyer Mill Blue Ticking Stripe Panel Set of 2 84x40 presented by&..
100% Cotton Timeless and true, the Sawyer Mill Blue Ticking Stripe Prairie Short Panel ..
100% Cotton The Sawyer Mill Blue Ticking Stripe Prairie Swag Set of 2 36x36x18 offered ..
100% Cotton Sawyer Mill Blue Ticking Stripe Short Panel Set of 2 63x36 offered by&..
100% Cotton Timeless and true, the Sawyer Mill Blue Ticking Stripe Swag Set of 2 36x36x..
100% Cotton Timeless and true, the Sawyer Mill Blue Ticking Stripe Tier Set of 2 L24xW3..
100% Cotton Timeless and true, the Sawyer Mill Blue Ticking Stripe Tier Set of 2 L36xW3..
100% Cotton! Timeless and true, the Sawyer Mill Blue Ticking Stripe Valance 16x60 offer..
100% Cotton! 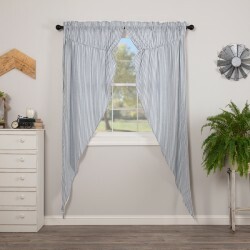 Timeless and true, the Sawyer Mill Blue Ticking Stripe Valance 16x72 ..